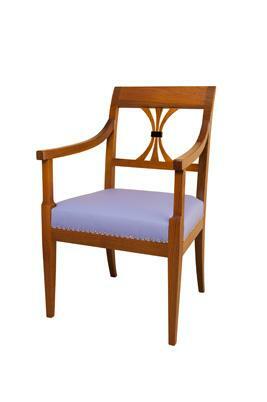 Gathered spindle-back chair, in Viennese Biedermeier style with armrests. The solid wood is stained and has a matt finish. The seating surface is covered with mium upholstery. Handmade spokes, bound by a black rectangular sleeve. The backrest is enhanced by an elegant rhombus inlay. The black border with its brass cap nails accentuates the profound character of the piece of furniture and emphasises its aura. Available in cherrywood, walnut and many other types of wood on request.